← On Saturday January 29, 2011 I buried my Grand Uncle a WWII Army Veteran, January 30, 2011 I sent my son to Serve our country in the US Army. Gene Vernon Kellogg, Seaman First Class (SC1c); chances are you don’t know him, what his achievements were, or even how he affected how you live today. I’ve never walked with him, never met him in person, or have spoken to him. I doubt that he and I have at anytime occupied the same space at the same time. But yet it still disturbs me when I see this, like many others, lives “For Sale” on EBay. and Naval forces. On July 21, 1944 he and the men of the 59th NCB, 1st Provisional Marine Brigade and The US Army 77th Infantry Division landed south of the town Agat on white beach 1 (Dati Beach). To get to the beach was difficult for SC1c Kellogg and the men of 59th NCB, the landing ships could not come closer than the reef which is several hundred yards from the beach. These men waded ashore though the coral and put together the pontoons to build floating piers so equipment and supplies could be brought ashore, while taking fire from mortars, artillery, small arms and snipers. Even after the Japanese were either killed or captured it was no joy ride there camp was in a swamp for months and 56% the men would come down with dengue fever. But this is not where SC1c Gene Vernon Kellogg’s story starts and although I can’t tell you about his childhood, his family or who his friends were growing up, I can tell you who this man was as a soldier. Gene Vernon Kellogg was born May 27, 1914 in Hansboro, North Dakota. On December 1, 1931 at the age of 17, he enlisted in the United States Navy as an Apprentice Seaman. He attended boot camp at United States Naval Training Center (USNTS) Great Lakes, Michigan. After boot camp he qualified as Ship’s Cook Striker and was assigned to the USS RIGEL (AD-13) a destroyer tender that was home ported in San Diego, California during this time Apprentice Seaman Gene Vernon Kellogg was promoted to SC2c (Seaman 2nd Class.) In 1934 he was transferred to and served aboard the USS ALTAIR (AD-11) that was also home ported in San Diego, California. He was discharged on May 25, 1935 in Oakland, California and was given $128.20 allowance (.05 cents per mile) to pay for his trip home to Grand Forks, North Dakota. At his time of discharge SC2c Gene Vernon Kellogg made $36.00 per month. In 1940 Gene Kellogg married Ruth M arie Redding of Marcola, Oregon. December 7, 1941 the Japanese attacked Pearl Harbor, like many American with prior service, he answered the call to serve his country once again. On May 30, 1942 in Mabel, Oregon; Gene Vernon Kellogg reenlisted, this time into a new Navy origination, The United State Naval Construction Battalion, The SEABEES. He was processed at Naval Recruiting Station (NRS) in Portland. From NRS he was sent to United States Naval Construction Training Center (USNCTC) where he learned construction and combat training. United States Naval Construction Battalion Fifty-Nine (NCB 59) was commissioned at Camp Bradford, Little Creek, Virginia, with Lieutenant Commander Paul Leg. Andre’s, CEO, USNR, as officer in charge and Lieutenant Earl W. Chidesterz CEC, USNR, as executive officer. On January 1, 1943, SC1c Gene Vernon Kellogg formed up with NCB59 as a cook. He was as one of the first enlisted men in the battalion and made history as the first generation of SEABEES. These men would create traditions, process and procedures that are still followed to this day. 26 Feb 45: NCB 59 departed from the U. S. Naval Construction Training Center, Norfolk, Virginia in three train sections. 4 Mar 43: The battalion arrived at the Advance Base Depot. Port Hueneme of California for advance training and outfitting. 21 Mar 43: The 59th NCB departed Port Hueneme for San Francisco. 22 Mar 43: NCB 59 arrived at San Francisco Port of Embarkation. 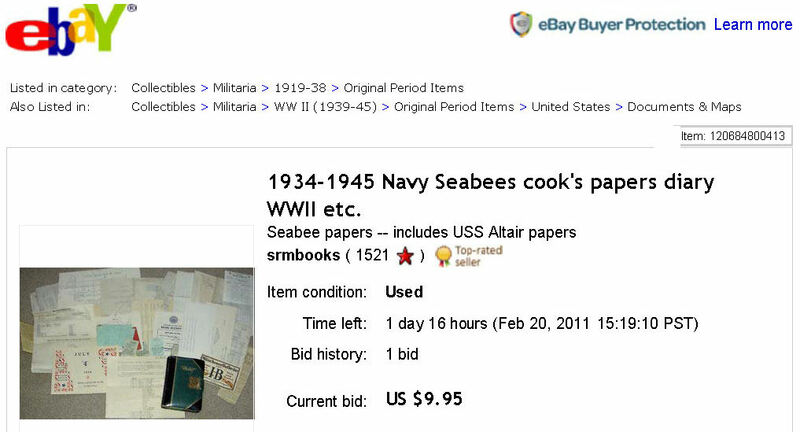 24 Mar 43: Seabees of the 59th battalion left. San Francisco for Hawaii. 30 Mar 43: USNCB 59 arrived at Hilo, Hawaii to begin construction of a strips and fiction facilities for the U. S. Naval Air Station to be jointly operated by the Army and Navy. 1 Jan – 15 Apr 44: A detachment from NCB 59, assisted by NCB 18, built a 2,000-man camp for the 2nd Marine Division at Kamuela, Hawaii. 15 Apr 44: Construction of the Naval Air Station, Hilo, was completed by NCB 59 two months ahead of schedule. 18 Apr 44: NCB 141 relieved the 59th Battalion at Hilo. 20 Apr 44: The NCB 59th Seabees departed Hilo. 21 Apr 44: On landing it Oahu, the battalion reported for duty under the seventh U. S. Naval Construction Regiment at Pearl Harbor. 19 May 44: Commander Andrews was transferred to duty as officer in charge of the 7th Regiment and Lieutenant Commander Chidester, the former executive officer, replaced him as officer in charge of the 59th Battalion. 1 – 18 Jun 44: Contingents of the 59th Battalion departed Pearl Harbor. 2 1 Jul 44: The battalions’ first echelon arrived in waters off Guam, Marianas on D-day. 27 Jul 44: The first echelon of the 59th went ashore at Guam with other garrison forces. 27 – 29 Jul 44: The balance of NCB 59’s Seabees arrived in Guam waters. 30 Jul – 18 Aug 44: The remaining contingents of NCB 59 landed at Guam in six groups. Aug 44: NCB 59 commenced working on construction assignments, principally reconstruction of the water system and erection of facilities for Naval Supply Depot. 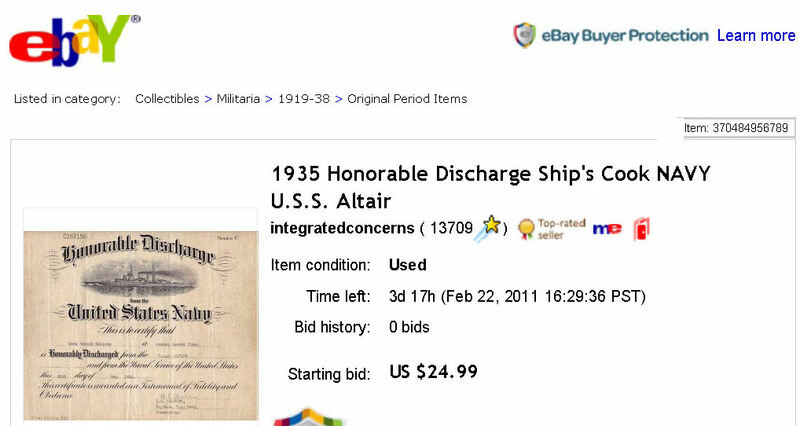 Jul 45: The Naval Supply Depot was turned over to the Navy. 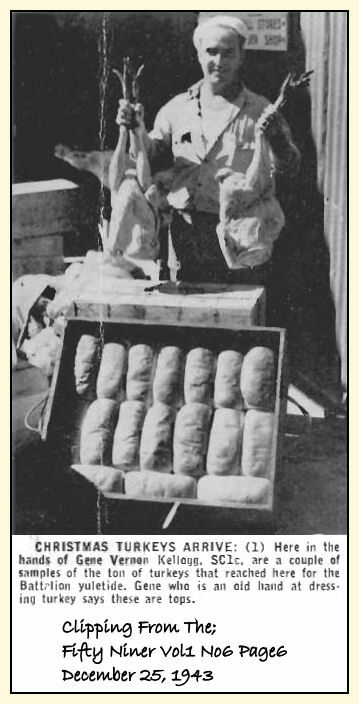 31 Aug 45: A11 field work wag terminated on orders from the fifth Naval Construction Brigade. 15 Sep 45: U. S. Naval Construction Battalion 59 was inactivated at Guam, Marianas Islands. After the war and deactivation of NCB 59, SC1c Gene Vernon Kellogg returned to the United States his ship sailed under the Golden Gate Bridge he was home in America. Gene Vernon Kellogg then 31 years old, was discharged on September 21, 1945 and was given $183.48 (.05cents per mile) for his trip home from Oakland, California to Mabel, Oregon. Gene Vernon Kellogg died May 6, 1980 at age 65 just 21 day before his 67th birthday and is buried at Rest Lawn Memorial Park Junction City Lane County Oregon USA, he was a member of the Greatest Generation….. And now his life is “For Sale” on EBay, … a sad way to pay tribute to one of our American Veterans. If I had enough money I would bid to win all of these items to hang on our wall with our family military memories so that this man would always be remembered by at least my family. This entry was posted in Uncategorized and tagged Construction Battalion, Gene Vernon Kellogg – Naval Consturction Battalion Fifty Nine, MCB, NAVY, NCB 59 SEABEES, NCB Fifty Nine, NMCB, SEABEES, Veteran. Bookmark the permalink. Thanks for writing this and putting it online. Gene Kellogg is my grandfather; I never knew him personally, and my mother is getting up there in years and has had some mental clarity issues as she ages; tonight she brought up her father Gene (I get my middle name from him) and talked at great length about him, and brought up that he served in the Navy and even remembered the name of his ship, the USS Altair. That led me to Wikipedia, which after we read up on the service of his ship, googling his name & ship, which brought us here. I read your writeup to my mother and showed her the picture you scanned, Gene with the Christmas turkeys. This really had an impact on her, and she’s probably happiest that I now know something of her father. Thank you again – I don’t know if you could have guessed back in February of 2011 that his descendants would have the occasion to read this and be informed of someone they didn’t get the chance to know. Kelly, it is fantastic to hear from you ! 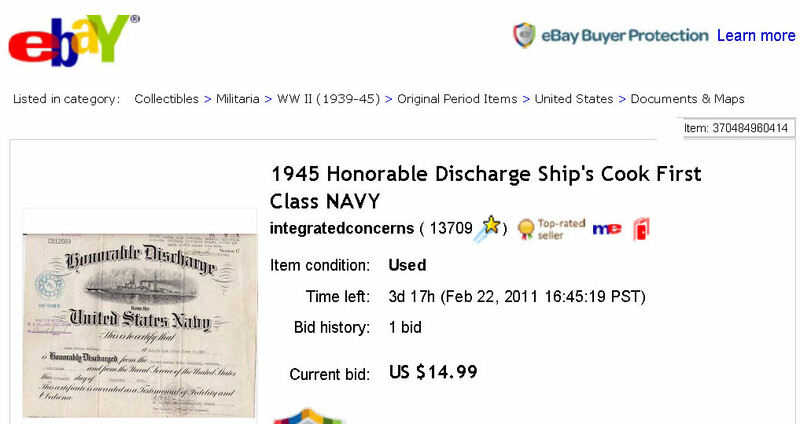 I ended up bidding and winning your grandfathers discharge certificates on eBay and would love to give them to you and your family where they belong. Your grandfather and mine served together in naval construction battalion fifty nine during WWII. I sent you an email with my contact info as well. My regards to your mother. I’ve seen his name on some of the records. Welcome 🙂 I have a BOX.NET account that has a lot of pictures. If you would like access just send me an email usabaker@yahoo.com and I will send you an invite. My grandfather was also with the 59th NCB – Seabees, Chief PO Henry E. Rolfe. I have pictures of him and his immediate group from a news paper at the time (Stars and Stripes I believe). I will email you to see if you have this picture and, if not, I will be happy to share it with you. It would be interesting to see if your grandfathers are also in this picture. I will share my favorite story here. As we know, in that era, if there wasn’t a tool to do the task, they made the tool then did the task. Henry’s hobby was watches and clocks. While on “an unidentified island” as they were building a landing strip, they were attacked by zeros. During the battle the crystal on Henry’s wrist watch was broken. After the dust settled, he went over to one of the downed zeros and cut a chunk out of the windshield. He saved this and took it home with him and created a new crystal and mounted it on the watch. My father still has the watch to this day.